Mr KNOW seems a bit hungry. A steamed sweet potato with Kimchi! Put sweet potatoes over the fire and wait for it. Mr KNOW! What is this stinging smell? and the pot got all burnt. 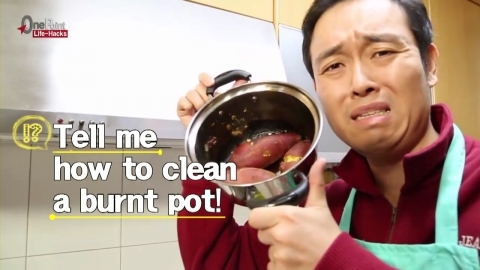 Tell me how to clean a burnt pot! 1) Put in baking soda and vinegar, then simmer them over low heat for 10 min. 2) Put in acidic fruit peels such as apples and then boil them for 10 min.